Stranco’s DOT labels help you meet the requirements of 49 CFR 172 for labeling of hazardous materials. 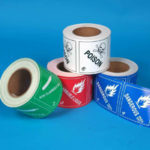 DOT labels for all nine hazard classes of hazardous material are available in rolls of 500 paper or vinyl labels. DOT labels measure 100mm x 100mm (4” x 4”).